Mike and I were nosing around in an antique store in Mt. Airy, North Carolina about a year ago when we came across a huge basket. The proprietor of the store explained that it was a "cotton picking" basket. Before me was this large, woven basket, a little lop sided, but in great condition especially considering it was probably from the 19th century. This particular basket, I believe, is made of strips of oak, although some are made of hickory. It was constructed so that there are two holes at the rim for handles and is about as big around as a whiskey barrel although not as high. I had never heard of a cotton picking basket and while I am typically not drawn to antiques or vintage items from the 19th century, preferring items from the early to mid 1900's, I have always had a fascination with baskets. Perhaps my love of old baskets originated with my grandmother's large collection that she had hanging on the wall for years, which included some old family heirloom baskets. I have long found the beauty and functionality of a handmade basket hard to resist. 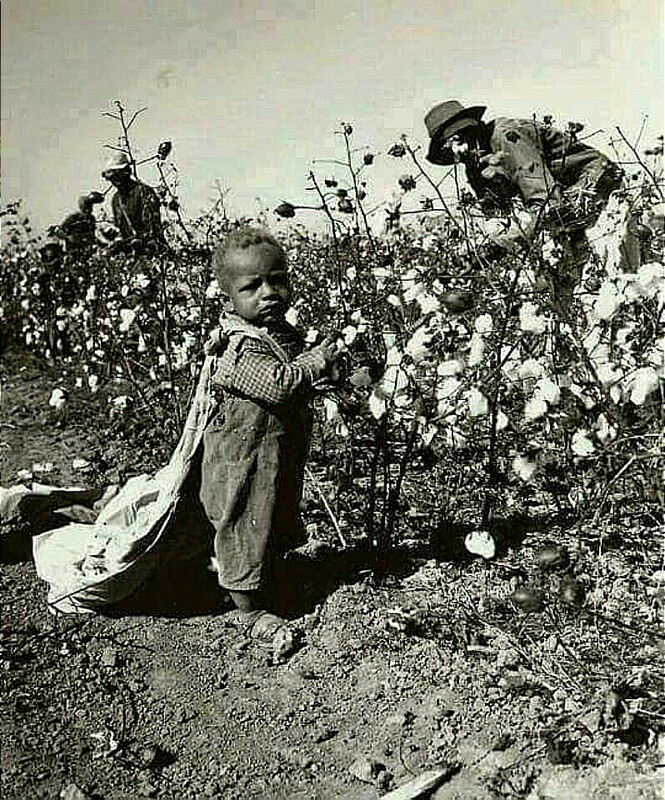 Growing up with southern parents, I was familiar with the phrase "just wait a cotton picking minute", and while some folks may consider that phrase as racist today, it simply meant to me that I better be patient until the adults were finished with the task at hand and could give me their attention. As I got older, I learned the history of the deep south became aware of the horrible time in American history when human beings were allowed to own other human beings. Upon seeing the large, hand woven basket sitting on a top shelf in the antique store in Mt. Airy, I immediately fell in love, although the potential historical implications of the basket were sobering. 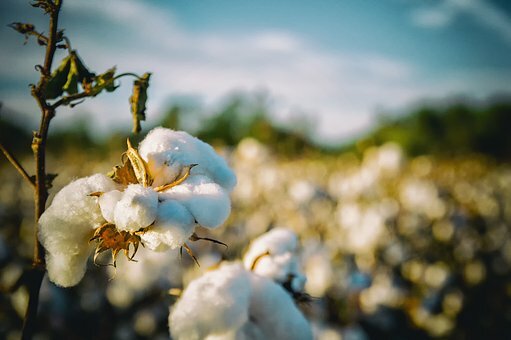 Aside from what I had learned in school about the cotton industry and the role that slavery played in that period of American history, I had heard stories about poor, white, sharecroppers first hand.. These folks were not from ancient history, but rather my dad's age. They told of growing up in the south on pieces of property that they didn't own, and helping to pick the cotton with their families who were just trying to make enough to get by. Their stories always detailed picking cotton and putting it into bags. As I stared intently at the basket, seeing one for the first time, I immediately started challenging its authenticity in my mind trying to think if the basket could have been used for something other than picking cotton. My first thought was that this large basket could not have been used for anything heavy. Having gathered a lot of produce, I knew one would not want to put anything in the basket that would bruise or be smashed. Cotton actually made sense for a basket so big. However, in my mind, it would be impractical to drag that big basket down the rows of cotton. The bags I had heard the old timers talk about from their share cropping days, in my way of thinking, would work much better. As all of the things ran through my mind, Mike looked and me gazing at the basket and asked if I wanted it and I told him, "Yes, but this item won't be going for resale." He laughed and bought the basket for me. The basket sits just off the kitchen area and as I work off my enamel table kneading bread, icing cookies, or making a cake I gaze upon it and my mind keeps going back to its history. I wonder at the hands that have touched it and the stories it could tell if it had a voice. The other day, once again I tried to find information on the basket, to see if I could verify that it was indeed a cotton picking basket. This time, I had better luck than the previous times when I had searched. What I found was literature that not only described the basket, but also told how it was used. 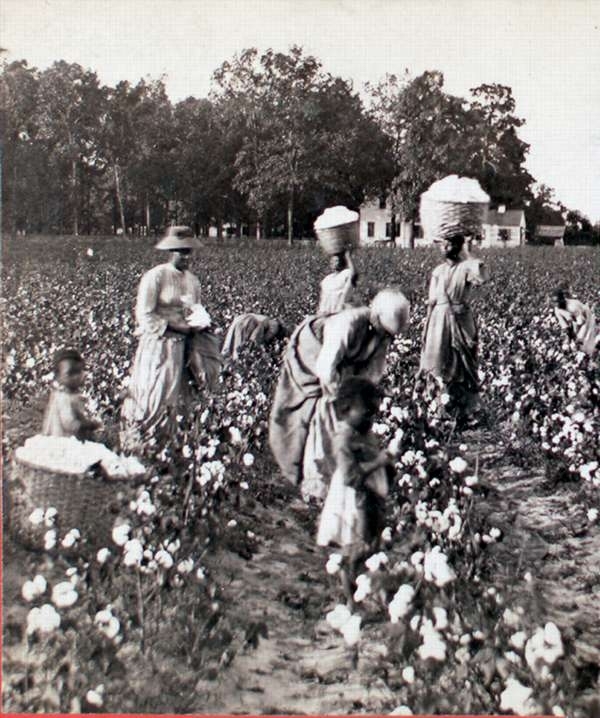 In addition, I was able to find old photographs that show without a doubt the basket I have is like the baskets used in the old south for cotton picking. The photos actually spoke volumes, some of which left me in tears.
" In the latter part of August begins the cotton picking season. At this time each slave is presented with a sack. A strap is fastened to it, which goes over the neck, holding the mouth of the sack breast high, while the bottom reaches nearly to the ground. Each one is also presented with a large basket that will hold about two barrels. This to put the cotton in when the sack is filled. The baskets are carried to the field and placed at the beginning of the rows. " "Sometimes the slave picks down one side of a row, and back upon the other, but more usually, there is one on either side, gathering all that has blossomed, leaving the unopened bolls for a succeeding picking. When the sack us filled, it is emptied into the basket and trodden down. It is necessary to be extremely careful the first time going through the field, in order not to break the branches off the stalks. The cotton will not bloom upon a broken branch. Epps never failed to inflict the severest chastisement on the unlucky servant who, either carelessly or unavoidably, was guilty in the least degree in this respect. 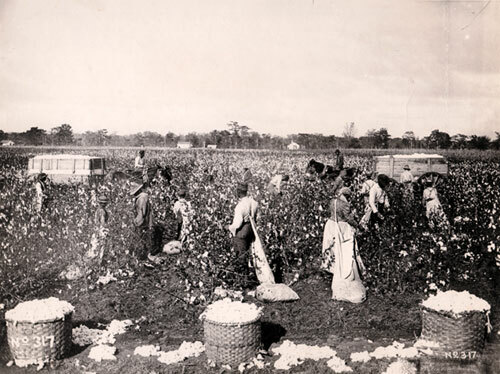 The hands are required to be in the cotton field as soon as it is light in the morning, and, with the exception of ten or fifteen minutes, which is given them at noon to swallow their allowance of cold bacon, they are not permitted to be a moment idle until it is too dark to see and when the moon is full they often times labor till the middle of the night. They do not dare to stop even at dinner time, nor return to the quarters, however late it be, until the order to halt is given by the driver. The day's work over in the field, the baskets are "toted," or in other words, carried to the gin-house, where the cotton is weighed. No matter how fatigued and weary he may be;no matter how much he longs for sleep and rest; a slave never approaches the gin-house with his basket of cotton but with fear. If it falls short in weight; if he has not performed the full task appointed him, he knows that he must suffer. And if he has exceeded it by ten or twenty pounds, in all probability his master will measure the next day's task accordingly. So, whether he has too little or too much, his approach to the gin-house is always with fear and trembling. Most frequently they have too little, and therefore it is they are not anxious to leave the field. After weighing, follow the whippings; and then the baskets are carried to the cotton house, and their contents stored away like hay, all hands being sent in to tramp it down. If the cotton is not dry, instead of taking it to the gin-house at once, it is laid upon platforms, two feet high, and some three times as wide, covered with boards or plank, with narrow walks running between them. " The entire selection (pages 163 - 171) is not that hard to read and gives one a glimpse into a moment of American history that we should never forget. You can read the entire selection at this link. I also found a fictional story in a vintage magazine ( McBride's Volume 20 page 445) entitled Little Lizay that helps to describe the use of the "pick baskets". Because of the format, I am unable to copy the text here, but it is interesting to read. 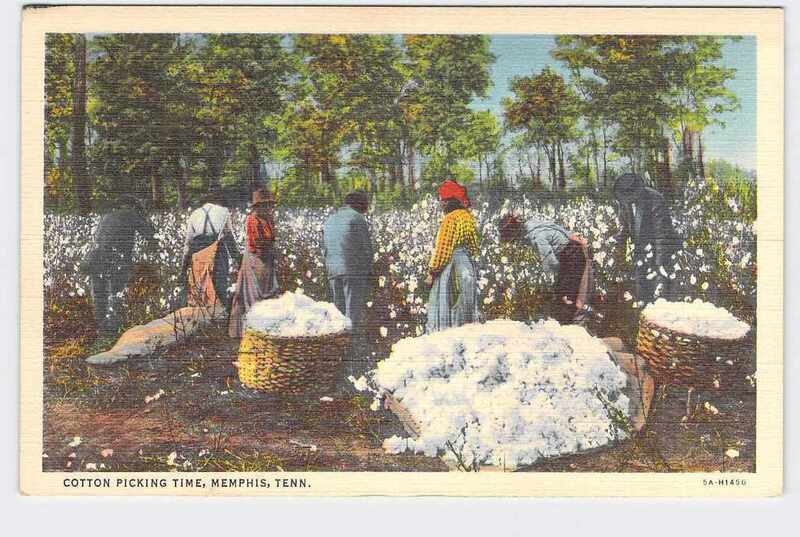 The slaves in the story pick cotton in their sacks and then transfer it over to the baskets. You can read this reference for yourself at this link. Should the link not go directly to the specified section, it can be found on page 445. Some may only see a large, 18th century basket as a fabulous, piece of farmhouse décor and never give a second thought to its link to a period of American history that was truly horrifying. Still others might find such a piece possibly connected to the history of slavery too horrifying to have in their home, feeling that the spirits of those touched by such tragic events might bring bad luck. For me, I am able to admire the beauty and workmanship of the unique basket while wondering about the stories the basket could tell if it could speak. For me, it is a figurative link to the spirits of men, women and children from the past who, if they could, would teach us important lessons about life. While my own personal history doesn't allow me to truly understand the horrors of slavery, I like to think that my heart, at minimum, is open to the lessons these souls would love to share about decency, respect, love and how we are to treat our brothers and sisters of one race, the human race. I was unable to verify the origin of this photo to give proper credit. I found it on Pinterest. I literally started crying when I saw this picture. If you can tear your eyes from the face of the child, you will see the type of bags that were used to pick the cotton which was then transferred to the large "pick baskets" put at the end of the rows.